Owen Jensen and Dainty Dotty: Owen Jensen was born in 1891 in Pleasant Grove, Utah. As a young man he worked in the railroad shop in Ogden, Utah. Jensen has said that in 1911 he walked 12 miles to Provo to see the Buffalo Bill Wild West Show and that was where he saw his first tattooed man. Owen Jensen got his first tattoo in 1913 from Bob Hodge on the Lucky Bill Show. Because he had skills as a machinist, Jensen was offered a part time job working in a machine shop making tattooing machines. He was interested in how the tattoo machines worked, and soon he became a tattooist. Jensen enlisted in World War 1 serving overseas. Jensen tattooed while in the service, but he learned how to draw flash later. When he returned to Pleasant Grove, Jensen built himself a trunk tattoo outfit and hit the road. In the following years, Jensen tattooed at several shows and in cities in Colorado and Wyoming. In 1923 Jensen headed for Los Angeles and when he first arrived the fleet was out so he took a foundry job. 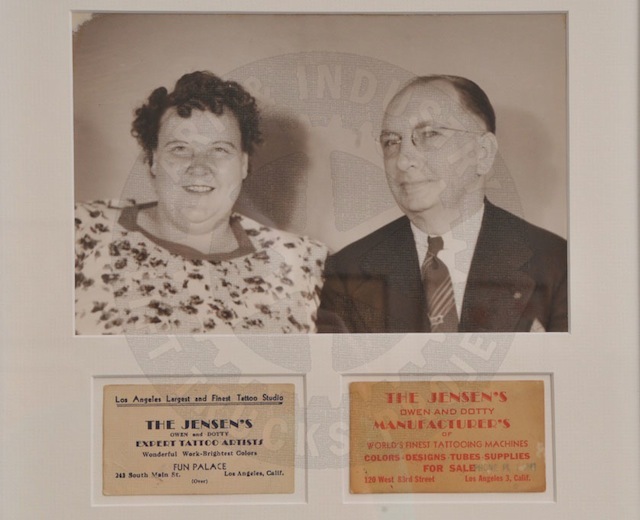 Owen Jensen married Dainty Dotty, a famous circus fat lady. It is said he also tattooed her. Weighing in at 600 pounds, Dotty was not considered the largest woman on record, but she was perhaps the largest female tattooist. Dotty died from a heart ailment in December 1952. On July 5, 1976, some young punks attacked Jensen, sticking a knife in his back and badly beating then robbing him. Owen Jensen never recovered from that beating. He died shortly afterward. Tagged: Bob Hodge, Buffalo Bill, Buffalo Wild West Show, Dainty Dotty, Owen Jensen, Tattoo, Tattoo Flash, Tattoo History.